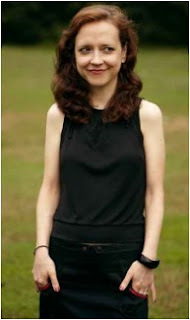 JULIA SPENCER-FLEMING: Thrillers are books involving two-fisted he-men saving the world (and a few women at the same time) right? Well, sure, if you're Clive Cussler. 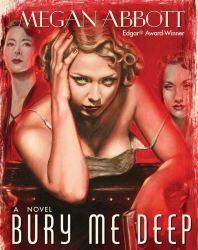 Not to diss Dirk, but here on Jungle Red Writers, we like smart, subtle crime fiction that keeps us awake at night while slicing us with human insight and razor-fine writing. In other words, we like Megan Abbott. Megan is an Edgar-Award-winning (and everything-else-nominated) author whose fiction routinely makes it onto Best Book of the Year Lists. 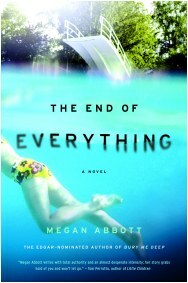 Whether she's writing neo-noir novels like Die A Little and Bury Me Deep, or intensely literary psychological thrillers, like The End of Everything or the upcoming Dare Me, Megan puts women's lives and their relationships with one another at the center of her work. Today, she's going to shed some personal light on the relationship between mentor and protegee; teacher and student. When I was in eighth grade, I was obsessed with the movie The Breakfast Club, which seemed to speak to my life in deep, resonant ways. I must have conveyed these feelings with great intensity to my beloved Advanced English teacher, Mrs. B, because somehow it came to pass that she spent one of her Sunday afternoons taking me to see the movie with her—a first viewing for her, a second for me. (It was rated R, so this was a particular coup). I remember the experience powerfully, remember feeling so flattered by all of it. I guess I’ll never know what made her suggest it. It was not something I’d ever heard of any other teacher doing for a student. It stuck with me. It felt like I had been singled out, was special. 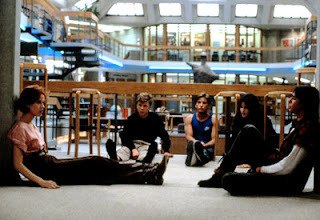 A few years later, while absorbed in all the mysteries and terrors of high school (far more harrowing than The Breakfast Club had warned), I learned that Mrs. B had died from breast cancer. It turned out she had been sick for several years, including when I was in her class, when we went to the movies that day. It seemed impossible—she was very young (my mom tells me now that she was only in her late thirties)—and unspeakably sad. The surprise I felt was acute. Mrs. B was unhappy? I’d never really thought about teachers being unhappy. About grown women’s unhappiness. And I certainly never imagined any of their private struggles. Mrs. B was cool, lively, loved books and paid attention to me. That was all I’d cared about, apparently. What an awful feeling, to realize how self-absorbed you were, or are. To Addy, Coach, who is young and pretty but also demanding and aloof, is a mystery she wants to unlock. She wants to be like her, wants to be her. It’s a powerful yearning, almost like a crush—maybe stronger because it’s safer. You never think you’ll get your heart broken. And you never, ever really know her life. At age 12 or 13, I was too young (at least in the ways that matter) to think of Mrs. B as anything other than this person who gave me books, who encouraged me, who took me to see The Breakfast Club that time. There’s an inherent selfishness, greediness of the protégée, which is, I guess, about being young. Everything is about you: she’s taking me to the movies, she’s interested in me, me, me. And I never thought twice about what her life might really be like, her pains and sorrows and heartache. But these mentors, they matter so much, don’t they? It’s the way we figure out ourselves, by imagining their lives, imagining ourselves in their lives. And then, eventually, realizing that their lives are not what we pictured, that life isn’t. A painful revelation, usually. Because it’s one of the moments you first realize how complicated life is, how hard. But we need those moments, like we need these women (and they need us, they need to see us believing in them). It’s how we become ourselves. Tell us about your mentor-protegee relationship, and you may be one of two lucky commenters to win an Advance Readers Copy of Dare Me! 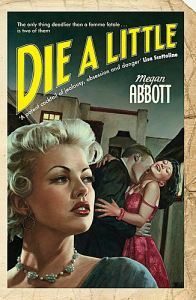 You can find out more about Megan Abbott and read excerpts of her books at her website. She also blogs with Sara Gran at the Abbott Gran Old Tyme Medicine Show. You can friend her on Facebook and follow her on Twitter as @MeganEAbbott. My mentor was Professor David Hoddeson at Rutgers, who edited the short story collection which served as my honors project. He is a kind and intelligent man, who also had the guts to red-pen the hell out of me and tell me when my stories weren't compelling, or as confused as I was at the time. We remain in touch, and he showed me what good stories can do, by introducing me to Katherine Anne Porter, Hemingway, and many more. I have been fortunate enough to have several mentors in different fields. It's a wonderful way to learn and to grow, as long as one keeps an open mind. 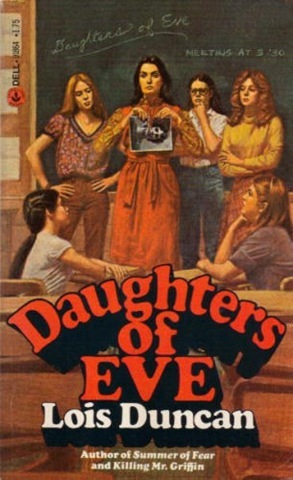 My favorite mentor, though, was the author Claire Shaeffer, who has written 15 or 16 books on various sewing topics, more than almost anyone else in that field. When I was writing my first book, a compendium of more than 100 case histories of sewing professionals, Claire introduced me to editor after editor, hoping one of them would publish the book. (Yes, her bio was in it, too.) Editors had a rough time trying to justify taking it on, though, since it was not actually a sewing book, per se; it was really a business book, just about the sewing industry. When, finally, I decided to self-publish, Claire gave me her blessing, and asked if she could buy the first book out of the box when I got them. I'll never forget her generosity. Also, the success of that book, which I hand-sold--more than 10,000 copies--brought a contract for two more books, and started me on a 15-year writing and public speaking career. Welcome, Megan! This topic is dear to my heart. In the years that I ran a university women's center, one of the programs I instituted was a mentor program. I've done independent consulting since then to a number of corporations to help them develop mentoring programs for their women managers. One of the things I've learned through the years is that lucky and smart people have more than one mentor. I used to try to teach my students that it was foolish to focus your life around just one mentor's help rather than identifying and seeking out mentors in several areas of their lives where they want growth. One of my major mentors has been the great writer, Sandra Cisneros--though Sandra, modest as she is, would simply say we are friends. She helped me to understand that I needed to find a balance between helping others and my own writing dreams so that my dreams didn't come dead-last. She has mentored many through the years. Linda-- Oh Sandra Cisneros! She once visited the ESOL students at the nonprofit I work at (Union Settlement in East Harlem) and have never forgotten her kindness to the students. I bet she's an incredible mentor (and friend!). Karen--boy, doesn't that show the power of a mentor to empower us to go places we may be afraid to go? Thanks for sharing. Thomas! Oh, yes, I've had some college profs who truly impacted me the same way. When I've taught, I've found one of the greatest rewards is getting to expose students to, say, Raymond Chandler for the first time. It's a privilege. What a lovely post, Megan. You're so right about that strange sweetness in realizing the teachers and others we loved for helping us had lives and emotions we never imagined -- but that they also needed us and the validation we offered them. My 5th grade teacher, Phyllis Cornell, taught me how cool learning and reading were--and courageously taught a group of Catholic school kids in 1970 the wild and popular songs our parents dismissed. I never knew why some parents disliked her so much that they took their kids out of the school for a year--and yet the school board kept her on, for which I am grateful still. And Barbara Sample, who taught a combined American history and lit class to high school juniors, was cool in yet more ways. She showed me the interconnections of disciplines and ideas, among many other things. I could name many other cool women I've been privileged to know, on this hot day. Instead, I'll get to think of them all day -- so thanks, Megan and Reds, for the opportunity! My first mentor was my first grade teacher. She was so smart and sure of herself, honest but kind--I still see her as an ideal to aspire to. Funny how someone you meet when you're so young can make such an impact. 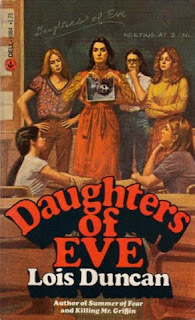 I think I read everything Lois Duncan (including DAUGHTERS OF EVE)when I was in 6th grade. Glad to see someone else who was inspired by her! LOCKED IN TIME was always my favorite. What a lovely and thoughtful post, Megan. It's started me thinking about my mentors and how they changed the course of my life. And very interestingly for me, the book I just finished explore that, except it explore the relationship between a young widowed teacher and the thirteen-year-old boy she befriends. A wonderful post, indeed. I had a courageous high school English teacher who bucked the trend of conservatism in our school. I still think of her. In this latest career of mine, my mystery writing mentors are many, and provide example, critique, and encouragement beyond the call of duty. Kate Flora and Susan Oleksiw first (and ongoing), then Hallie and Roberta at Seascape, Hank everywhere I run (physically or virtually) into her, Jan at Crime Bake. The list goes on. My first book comes out in two months and I couldn't have done it without all of them. I loved Ms. Abbott's post. It made me think of a man I worked with who taught me how to grow up; how to think of others, not just myself. My Mom and Dad worked hard at it, but that was Mom and Dad. This mentor made me pay attention. Interesting how Jack phrased his comment--"My Mom and Dad worked hard at it, but that was Mom and Dad." I agree that we may not take our parents' mentoring seriously. I did take my oldest sis seriously. She's ten years older in years, but full of wisdom, grace, and the ability to accept an unexpected little sis. She's still a "life" mentor. For my ability to critique, Warren Norwood, who impacted not just his readers, but also those who survived "Hack & Slash" and became respected authors (one an eighth of our JR women). Thank you all so much! Edith, thinking of all my English teachers--my goodness, they really leave their stamp, don't they? Open up whole vistas. Diane, I really like the life mentor idea...it opens up a whole different set of important people in our lives. Susan, another Duncan fan! Little, Brown is reissuing most (maybe all?) of her books...what a thrill! Your reflections about the books are so intriguing and somehow present a profound analyses together with personal impressions. 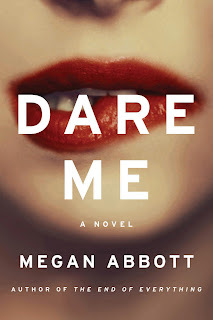 I am strating to read Dare Me this weekend, after being mesmerized by your comments on it.